It's barely noticeable to passersby, but a piece of paper taped to the door of a small Mediterranean restaurant has caught the attention of Montrealers. It reads, "People with no money welcome to eat for free." 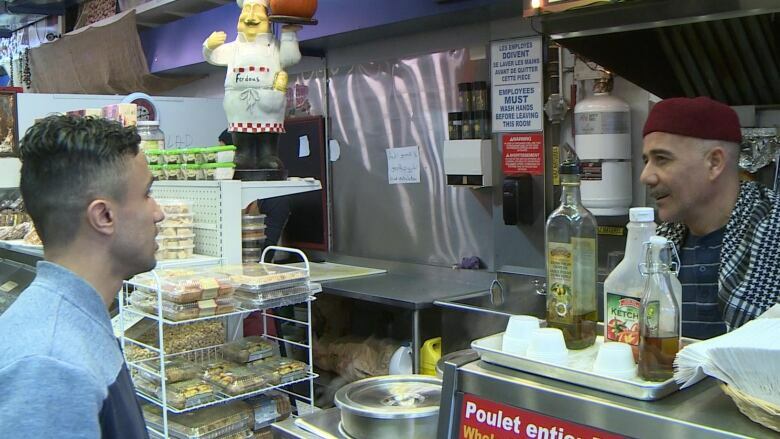 It's barely noticeable to passersby, but a piece of paper taped to the door of Marché Ferdous, a small Mediterranean restaurant in downtown Montreal, has caught the attention of some Montrealers. 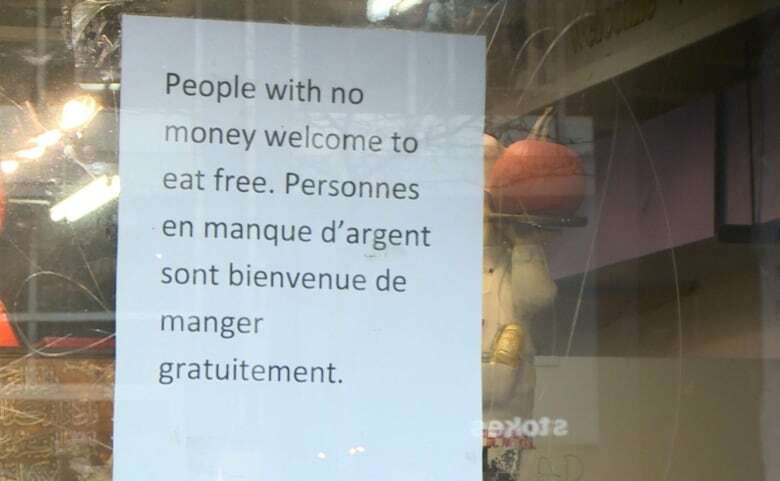 The sign, written in both English and French, reads, "People with no money welcome to eat for free." That goodwill gesture has won the restaurant, located at the corner of Ste-Catherine Street West and Mackay Street, a lot of praise online. The restaurant's co-owner, Yahya Hashemi, said they've been giving free meals to the hungry for about five months now. He added that they consider it as a business expense. "We don't think about how much it will cost us," said Hashemi. They serve free meals to about four or five people a day, and staff do not ask questions or judge anyone who asks for a free meal, he said. The idea began when Hashemi, who also owns the currency exchange service next to the restaurant, realized how often he would be asked by people in the area for spare change to buy food. At first he would give them money to spend in the restaurant, but then decided it would be simpler to put up a sign in the window welcoming everyone to eat for free. "Some are shy, some don't believe we are offering this," said Hashemi. 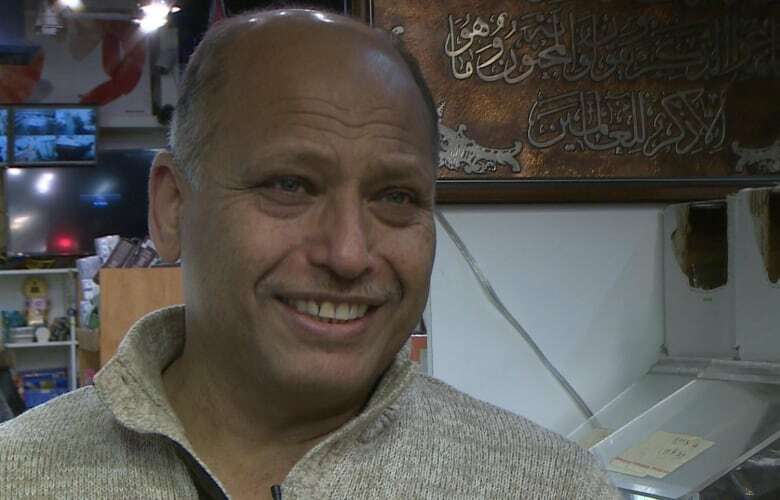 Originally from Iran, Hashemi said it is part of his faith to help those in need and he wanted to give back to Canada since he says it has given him so much. He does not believe people will take advantage of the restaurant's generosity. Some customers, inspired by the goodwill of the restaurant, have begun donating money to make sure they can feed as many people as possible. "They come here, they donate $20, $30, $50 and they say, 'O.K, the next few people are on me,'" said Hashemi. Word of the restaurant's generosity circulated online after a post on Facebook was widely shared on Monday. The post's author, Sean Jalbert, said he noticed the sign and wanted to put the offer to the test. Telling staff he had no money, he was given a free meal without any hassle. "I was humbled and blown away," said Jalbert, adding they were very friendly and welcoming. After he finished eating, he revealed he had the money and paid for the meal in full. Jalbert said he had to share the experience online and hoped others would spread the word so that those in need could hear about the restaurant. Customer Daniel Legace said he's happy the restaurant is open in the neighbourhood. "It's a very good thing for the homeless," he said.